DETROIT (FinalCall.com) - U.S. District Court Judge John Corbett O'Meara, after denying Michigan's motion to dismiss a lawsuit that would allow nine of the state's juvenile lifers to be considered for parole, is now considering the state's move to appeal and stay further progression of the suit. Many juvenile lifers, those sentenced to die in prison for crimes committed when they were under the age of 18, and their advocates hailed O'Meara's decision July 11 in Hill v. Snyder (USDC Case No. 10-14568). While striking eight of the nine plaintiffs, all but Keith Maxey, who was sentenced in 2007, from the case on time limit issues, the judge left alive key elements relating to the U.S. Supreme Court's 2009 decision in Graham v. Florida. In that case, the nation's highest court ruled that it is unconstitutional to sentence juveniles to life without parole in non-homicide cases. for Plaintiffs on a claim that was previously unlikely to be viable,” O'Mera said. O'Meara ruled that Michigan's claims that the Graham v. Florida decision barred any consideration of claims by juvenile lifers involved in homicide cases did not hold water. “Defendants [the state] suggest that the Court ‘effectively reaffirmed' the constitutionality of life without parole sentences for juvenile homicide offenders. The Graham court did not expressly consider that issue, however, and much of its reasoning could be read to call into question the constitutionality of such sentences,” O'Meara said. He also cited the U.S. Supreme Court's ruling in Roper v. Simmons, which outlawed the death penalty for those who were juveniles when their crimes were committed, as another example of a ruling recognizing that the treatment of juvenile offenders should be differentiated from those who are mature. Later, he denied a motion by the National Organization of Victims of Juvenile Lifers to file an amicus brief in the case after they missed the deadline. Edward Sanders, who has been in prison since 1975, convicted of first-degree murder at the age of 17, but not as the shooter, earned his bachelor's degree in Michigan's prisons while college education was still part of the Michigan Department of Corrections (MDOC) curriculum. He has studied law and acted as a “jail-house lawyer” for many years since. Attorney Kimberly Thomas, writing about Graham v. Florida in the Michigan Bar Journal, agreed. The state, however, essentially claims in its interlocutory motion for leave to appeal and for a stay of the proceedings that it has the right to contest O'Meara's assessment of the U.S. Supreme Court decisions. This is while Michigan plans to spend $2 billion a year on its prison system beginning Oct. 1 under Governor Rick Snyder, $11 million more than last year. At the same time, 15,000 families, including children and babies, will be cut from state assistance effective Oct. 1, supposedly saving $75 million a year, leaving them to starve in the streets. Snyder did not see fit to comply with a plan laid out in a March 2011 symposium that would cut $500 million from the prison budget. The symposium, “Finding the Path to a $1.5 Billion Corrections Budget,” was not a gathering of wild-eyed radicals, but instead a joint effort of the generally conservative Citizens Research Council, the Center for Michigan, and the Citizens Alliance on Prisons and Public Spending. According to the Center for Michigan, there are 18 reasons for cutting Michigan's prison budget. Many states have already outlawed juvenile life without parole sentences, or have no one serving them, according to Human Rights Watch (HRW). 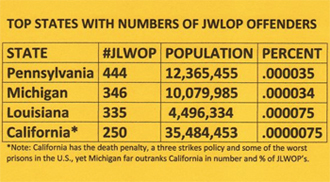 Altogether, according to The Juvenile Justice Project of Louisiana, ONE-HALF of states in the country either have abolished JLWOP or have less than 10 individuals serving these sentences. 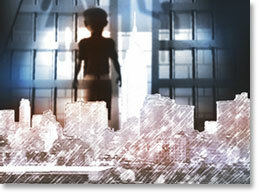 According to HRW, there were 2,750 individuals serving juvenile life without parole as of 2009. The map shown, by the national ACLU, shows their distribution by state as of 2007. Pennsylvania, Michigan, Louisiana and California have the highest numbers and rates, with Michigan running second in total numbers, and barely third in per capita rate. Senate Bill 9, authored by State Senator Leland Yee, moved to its third reading prior to approval Sept. 2. Most believe it is likely to be approved. The Huffington Post reported Aug. 17, “According the bill, defendants who were sentenced to life with no parole for a crime committed as a minor would be eligible to apply for a lesser sentence of 25 years to life. Prosecutors here in Michigan, including Wayne County's Kym Worthy, and Oakland County'sJessica Cooper, testified against earlier bills that were even more stringent than California's. Those bills died in session. Here in Michigan, the hopes of over 350 individuals serving JLWOP, having been repeatedly thwarted at the legislative level, by county prosecutors such as Worthy and Cooper, and by state courts, now rest to a great degree on the speedy progress of Hill v. Snyder in the federal court.